Two pictures to illustrate how I try to take inspiration from the natural world in creating ‘playful landscape’ features. The playful landscape was created in Fakenham, Norfolk. The ‘Giant’s Causeway’ here uses different lengths and thicknesses of smooth-planed, pressure-treated timber, inserted into a concrete foundation within a formed, grass covered mound, and with gravel to fill in around each ‘step’. It’s ‘Play Day’ in England today, so I thought it would be appropriate to report on my recent visit to the new Olympic Park Play Area in Stratford, London. The ‘Tumbling Bay’ play space has just opened in the north of Queen Elizabeth Olympic Park. Designed by LUC and Erect Architecture, the space is the core social area for this part of the Park, which opens fully next April. It aims to provide a facility of use to both visitors to the area as well as the growing new residential community in the area and local workers. The naturalistic play space is based on ecological concepts of succession and life cycles and is laid out along a newly created valley, with a new ‘Timber Lodge’ café and community hub at one end. I must say that I was impressed with what I saw. Given the heavy use this area is likely to see and that it is unsupervised, the designers and builders have done a great job at maximising natural play opportunities in an urban setting. I think children of all ages will be able to get something from it. At one end a climbing structure consisting of natural, rough finish timber bridges, ascents ,plus net walkways and other nooks and crannies is an exciting physical circuit for mainly physical play. The structures here are not so much designed on the drawing board as created on the spot – at least that’s how they look, with rough-hewn timber providing a wonderful variety of opportunities for climbing, clambering, crawling, walking and just sitting around. This wood- strewn area gives way to an area dominated by a river delta – ilke landscape of gullies, pools and waterways. These are fed by a number of hand pumps and can be dammed at various points. And there are also spots offering a mix of sand and water play. The use of what seems to be blocks of natural (sand?) stone and sculpted landforms (made of composite materials?) conveys a natural look that could have been here for decades. Apparently the sand and water play area was inspired by the history of the River Lea and its industrial past. The arrangement of pumps and dams encourages children to experiment with water flows, work in groups and pump sufficient water to dam and divert water through the natural rock pools, rivulets and channels, filling a series of shallow pools and sand boxes along the way. Finally, and running up to the cafe, is an area where water gives way to sand – dominated play, featuring a hanging conveyor system using sections of tyre and allowing children to move quantities of sand around the area. There are also a number of chunky wooden and gabion structures that are at different times seats, walkways or climbing features. I particularly liked the use of simple planed timber planking set around in odd places in the floorscape with grooves cut at right angles. I guess these are to provide a varied, grippy surface, but can also be a great little place for the very young to experiment with sand and water and other loose materials. There are also some young hazel woodland copses where, in due course, children will be able to explore and build dens, hunt for bugs and get their hands dirty. The copses adjoin some ‘pine forest’ areas which run up against the timber play area. The curving form of the play area and its use of planting makes it blend in beautifully with the adjoining parkland landscape, avoiding the problem of all too many play spaces that stand out as colourful, metal-dominated, jarring places amidst surrounding greenery. The lack of fencing, but use of planting, land form and a variety of different log slice/trunk footways to provide barriers and create entrance and exit channels should also encourage children to play in the surrounding grassy and planted areas. It is free to visit the parklands, cafe and playground. We enjoyed a lovely cup of coffee served by smiling staff at the new social enterprise – run cafe and events centre, which seemed to be doing a steady trade in these early days. I was interested to see that local primary schools have already contributed to displays in the Centre and this sign of community involvement is an early indicator of it becoming a successful community hub. As you can see from the photographs, we were there early in the day, so only a few children were around. On our way home we passed lots of families with children who looked as though they were on their way to the park and play area. If you get the chance it’s well worth a visit! The ‘Education Garden’ at Gressenhall Farm and Workhouse Museum, Norfolk, was in need of a ‘refresh’. As part of my one year Heritage Garden Traineeship I came up with a new design, having consulted staff and volunteers. The agreed design was carried out in 2012 by me and other volunteers at the Museum. It features some minor adjustments to the former planting areas, terraces and grass and also includes an area designed for pre – school children, known as ‘Curiosity Corner’. ‘Curiosity Corner’ is deliberately child – sized, with a winding bark and pebble path and deep borders that sometimes rise above and fall below the path. There are living structures – a willow tunnel and two entrance arches. A ‘pebble mountain’ and a series of wooden features are complemented by a low level mirror, as well as a number of metal and wooden birds, insects, butterfly and a cat, windmills and other ‘oddities’ such as a ‘fossil slab’ set in grass and a wall mask of a ‘small friendly giant’- the idea is to provide unusual things for the the children to spot and stimulate their imaginations. The planting is varied and includes species with interesting leaves (e.g. Stachys byzantina or ‘Lambs Ears’, ferns and grasses) and last year children planted Sunflowers which grew to an enormous height! There is also a turf seat and a half barrel water feature (complete with metal frog). The garden has now seen a full season of ‘wear and tear’ and has stood up reasonably well – it seems to have been a popular addition to the Museum. However, some adjustments are needed to prevent children accessing the inner path from the terrace, strengthening the enclosed feel of the space and replacing the turf seat which has not really withstood the wear – it has turned into a mound for running up and down rather than sitting on! These changes will be carried out soon. Two projects in the village of Cawston, Norfolk enabled me to ‘cut my teeth’ on designing playful landscapes. Both were completed about 6 years ago and largely on a voluntary basis. I remain involved at the local Primary School, helping them with their School Gardening activities, but my early involvement was in designing, sourcing planting and organising the creation of an ‘Eco Park’ – basically to try and diversify the habitats and play opportunities in a bland, mown grass playing field with a solitary multi function play unit. The design features a curved mixed native species hedge (which is now over 2 metres high) and a haven for wildlife, several groupings of native trees such as Silver Birch, Hazel, Douglas Fir, Beech, Oak, Feild Maple, Mountain Ash and Black Poplar, and some areas of shallow mounding. The planting has been used to create several different spaces, and grass within these has been left to grow long both to provide varied habitats and interesting play areas. In addition a ‘Nectar Bar’ of insect – friendly herbaceous and other flowering plants has been created alongside the school, including a painted pergola which both helps to privide shade to the south – facing side of the school and added planting interest. The second project involved working on commission for the Parish Council and a local charity to design, seek funding, consult local people and supervise the creation of a new play landscape at the ‘Oakes Family Field’ located to one side of the village. The design was constrained by the need to retain areas for cricket and football pitches and to avoid placing play areas close to housing on one side of the field. There is a mix of landscape features including a large mound (with a slide), timber play equipment for balancing and enclosed social areas, as well as a selection of traditional play equipment in two main areas, one for younger, one for older children. Over £100,000 was raised from various sources and so a wide range of play equipment and features has been possible. This steeply sloping, grass site in the Norfolk town of North Walsham is surrounded on all sides by housing and has areas of mature trees and scrub. I was commissioned by North Norfolk District Council to provide design, specifications, procurement advice and project management. The budget was around £60,000, funded by the Government Playbuilder Programme and local Housing Associations. Local consultation was undertaken by the Council and helped to inform the final design. The overall design concept was to enhance the parkland feel of the site and use large species trees to achieve a stronger organisation of spaces which are of general interest and which provide different play opportunities in keeping with the overall character of the site. The final scheme features a large turfed mound and ditches at it’s centre with an aerial cableway off one end of this. A multiplay unit is located in a crescent of existing trees. Other play equipment, football and basketball nets also feature. There are Log slices for stepping stones and seating etc. A new formal avenue of Limes and Red Horse Chestnut Trees was also planted. The scheme was completed in May 2010. The play landscape in this Norfolk village was created to partly replace, as well as enhance an existing fenced play area with wooden and other equipment, which was set wide apart and surrounded by grass. This adjoins an area of the local recreation ground and a small area of woodland/hedgerow. I was commissioned to provide design and specification plus project management advice. There was an initial budget of £50,000, funded by the Government Playbuilder programme plus contributions from local organisations. 1. Expanding the play space – using the identified budget and the Design Brief as a starting point, expand and link the existing play space so as to utilise the play opportunities offered by the nearby wood/ hedgerow, allowing for future fundraising and community self-build. 2. Enhancing Play Value – increase the number and range of play opportunities for all abilities and ages, focusing on 8-13 year olds and with some provision for toddlers. 3. Creating an attractive community space – create a welcoming, attractive space for children and adults which is coherent, provides interest through varied height and colour, creates a sense of discovery, uses existing/ donated play equipment (where possible), and landscape features to create play value and enhance the appearance of the space. The resulting design extends the play area into a larger space (requiring the movement of a football pitch) and integrates this with retained, refurbished play equipment. Old fencing was removed and replaced with shrub planting and trees to indicate boundaries, an existing mound and new grass mounds were created to provide play features and to house a tunnel, wide slide with graded wheelchair access and aerial cableway. 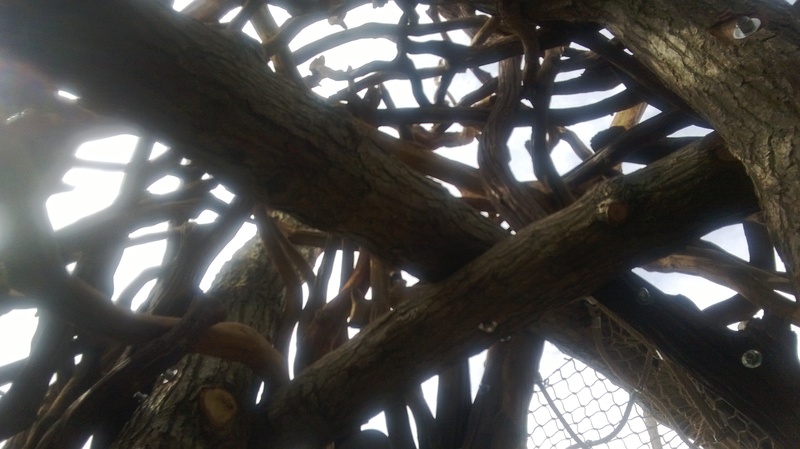 There is a wooden climbing feature, plus additional play equipment for toddlers and older children, including a simple wood slice spiral with spring bulbs planted to mark this, a log seating area/ social space, basket swing, spinners, and areas of longer grass. The project was substantially completed by June 2010. This is my first post profiling some of the ‘Playful Landscapes’ I’ve created in the last few years. Wensum Way play area, on the southern side of the Norfolk market town of Fakenham, is a sloping site surrounded by housing on three sides and private woodland with public access on the fourth. I was commissioned by North Norfolk District Council to design, produce specifications, assist with procurement and project manage the building of the new play area. The budget was £65,000, funded by a combination of money from the Government Playbuilder programme and local Housing Associations. The brief was to create a challenging play experience for mainly older children, including teenagers. The Council carried out consultation exercises with local people, including children, and the findings informed the final design. Given the size of the site, budget constraints and proximity of housing (some occupied by elderly residents) this project was a challenge, but a combination of keen pricing by the equipment suppliers and landscapers plus use of ‘custom built’ landscape features, has resulted in a varied popular design. This includes turfed mounds and banks of new planting (both provide screening and play value) and a scooped out ‘bowl’ plus a timber-backed ‘performance area’. There is a mixture of standard play/ sports equipment and wooden posts, cubes, timber log slices and logs are all used to ctreatea range of gathering, imaginative and physical play spaces. The design also features a wild flower meadow, areas of longer grass and picnic tables for families visiting the space. The project was completed in June 2010.